Nikon viert zijn 95ste verjaardag en introduceert de D600 Wordt de Wii U de volgende evolutie van de Game Console ? Just a few weeks ago, I got invited to Nikon’s 95th birthday party in Belgium where they presented the Nikon D600. Back then I wrote a little blogpost about it in Dutch which you can read right here. In short … Nikon announced it’s D600 which is Nikon’s smallest full-frame camera ever. 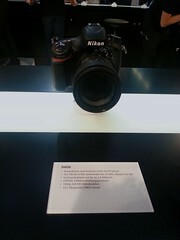 The Nikon D600 is equipped with the full-frame FX sensor which was currently only available in professional devices. Not only does it capture images at 24.3 megapixel, but it is also supposed to work a lot better in low light situations. Some additional features in the camera were Time-Lapse, a double virtual horizon and many more. What seemed interesting to me was the WU-1B mobile adaptor which gives you wifi, allowing you to share you pictures on the internet, but additionally also allowing you to control you camera from any Android or iOS powered device. At Photokina I even spent a bit more time with the Nikon D600 and it left a very good impression again. The only problem I had was the controls, but I guess that is normal for someone used to a Canon. A few months ago I started thinking about buying a new camera body, and maybe switching to a full-frame camera body. So I checked the Canon 5D MII and the Canon 5D MIII. Although those are amazing bodies, I couldn’t really justify the price tag they carried. I’m not a professional photographer … so it’s easy to start and hesitate if you really need such an expensive body. Then I got to play a bit with the Nikon D600 and I got tempted … I really was hesitating. But just as you start to hesitate about switching to Nikon, Canon brings out a new model … the Canon EOS 6D. Well … the Canon EOS 6D has wifi on board and includes a GPS for automatic geotagging of your pictures. Personally … I don’t really care about all the other differences, but the fact that the 6D has wifi on board and a GPS convinced me to check if I can pre-order it. Of course, the fact that I already have 3 Canon lenses and an external canon speedlite 580 flash helped a little as well. 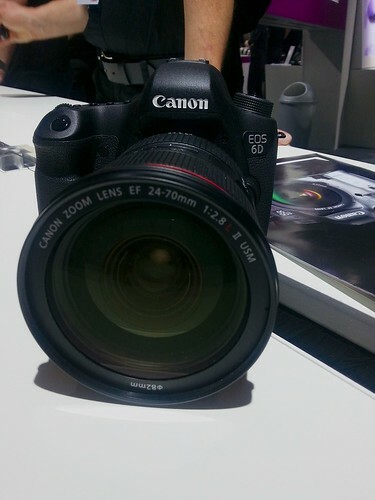 At Photokina I immediately tried to get my hands on the Canon EOS 6D and played around with it a little. Sadly my playing time was quite limited since there were hundreds / thousands of others waiting in line, but from what I have experienced the results are comparable to those from the D600. I really wish I could have played with it a little longer. Personally I don’t have any off-brand lenses yet, but I have heard lots of good things about Tamron and Sigma, so I thought I could go look up their booth. The Sigma booth had most of it’s lenses on display (even the Bigma). What I loved about the Sigma booth is that you could go to the desk with your own body and try out some of their lenses. I played around with their 12-24mm lens and the results were quite good. So I decided to try out some more of their lenses, including the Sigma 50mm f/1.4 EX DG HSM and Sigma 30mm f/1.4 EX DC HSM. All of they seemed pretty good, though at first I had the impression that they were a bit slower when focusing. This is of course purely based on my own impression. Enter the Quick Shoot Strap area ! I have seen many of those in the past and quite a few different ones at Photokina as well. Although all of them solve the problem I mentioned, most of them still have one issue. If you need to unhook your camera from the strap in order to put it on a tripod, you have to do all sorts of strange things. The Hama Quick Shoot Strap solves this problem. The strap can easily be attached to a threaded plate on the tripod socket of your camera. That plate also has a thready in it’s plate which still allows you to use it on a tripod. 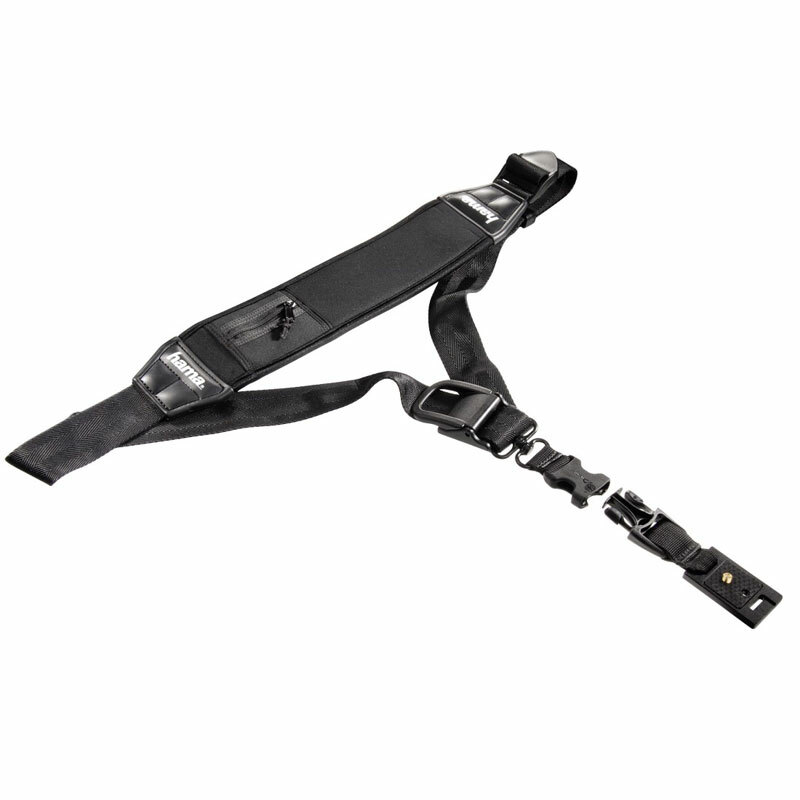 Additionally the plate can be detached from the strap using a 3-point safety lock. And if that isn’t enough, you can easily slide the camera over the belt and fix it at any point using a break mechanism. Sadly I couldn’t buy a Hama Quick Shoot Strap at Photokina, otherwise I would definately have spent the 60 Euro on it ! I have absolutely no idea how it is called, but I think you probably will all know what I’m talking about. 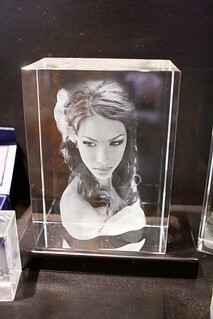 We all know the Glass block or cube which seems to have a image etched inside it. If you still have no clue what I’m talking about it, I have included a little picture. Well … at Photokina I noticed one particular stand which had some amazing 3D like versions of this. One had a face of a baby inside a block of glass, and the babies eyes were somehow looking at you … no matter where you were standing. If you walked from the left side of the ‘sculpture’ to the right side, the eyes kept following you. We all know Smartphones, but what about Smart Cameras ? By now most of us know what a smartphone is, and probably a lot of readers already own one. Quite a few might even use their smartphone as a camera. But what if we could get our hands on a smart camera ? Well … a good way to start would be to check the Samsung Galaxy Camera. The list of features on the Samsung Galaxy Camera would be too long to mention here. It contains a Wifi and 3G / 4G module which allows you to stay connected and upload your pictures to the different sharing services. It carries a 23 mm wide angle, a 4.8 inch touch display, an is supposed to give you a 21x zoom. 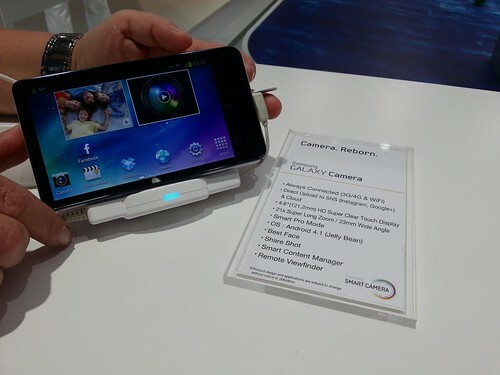 Additionally the camera is powered by Android 4.1 bringing apps like Instagram and other photo apps to your camera ! Some of the things I found interesting were the Smart Pro shooting modes. Those allow you to capture the motion of a waterfall or freeze a frame for action shots, shoot panoramas or even slow motion movies. Lets say you want to take a picture of your 4 kids together. You press the shutter and notice on of them just closed his eye, so you give it another shot. Sadly … this time … not all of them are looking into the lens the way you expected, so lets try again. You probably catch my drift, but it could take you quite a few shots before you have all 4 faces the way you want them in a single shot. You press the shutter, and the Samsung Galaxy Camera takes 5 shots. Since the camera has facial recognition (like the Samsung Galaxy S III), it knows where the faces are, and shows them in a square. You tap the first face and the Samsung Galaxy Camera presents you the same face from the 5 shots and allows you to choose which face you want to use, just tap the one you want and it gets edited into you shot. In our little demo it worked quite well, so I wanted to try it myself and have my wife and a friend pull of some crazy faces. Surely I was able to edit in the two most crazy faces into the shot, and at first glance I couldn’t really tell the faces didn’t fit into the picture. According to the samsung website the camera comes with 65 powerful editing features, and the ‘Smart Face’ feature is only one of them, so I’m really interested in learning about the others. Of course there was a lot more to see at Photokina, and I really did see a lot more. 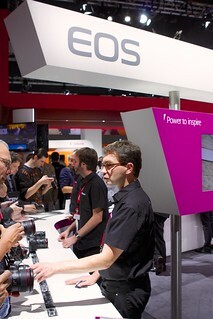 I spent quite some time at the Sony booth too, but I couldn’t get my hands on one of those Sony Alpha camera’s. I heard a lot of good things about their Translucent Mirror system, but don’t have any real-life experience with it. I think I checked about 50 different camera bags, and some of them looked really nice, but it is quite hard to base a review on a 2 minute test. The bags from Boblbee looked quite good and colorful, so I’m quite interested in those. There was a whole hall with lots of lighting and related stuff, but since I havn’t done any product or studio photography yet, I didn’t really check them in detail. One thing which looked interesting though was a small light box / tent with lights. This would be quite interesting for product photography if I ever venture into that area. In the end Photokina was really worth it, and if you are into photography you should really go check it out in 2014. I’m quite sure you will find something for your needs at Photokina 2014, and if it’s not gear, it will be inspiration from one of the many exhibits or knowledge from one of the many workshops. Personally I hope next time I’ll be able to interview some people. This year I only took a few shots with my camera, and I hope to be able to edit a short video from that later this week. Oh … and if you’re going to Photokina 2012, make sure to spend a few days in Köln as well, the city has plenty of bars, restaurants and things to see. Oh and if you are into Sushi, make sure to pay a visit to Sushi am Ring, had a delicious meal there thanks to a suggestion from one of my German Samsung Global Blogger friends. Finally, if you want to see some more shots I made at Photokina 2012, feel free to go check my Photokina 2012 set on Flickr. Photokina 2012, a set on Flickr. 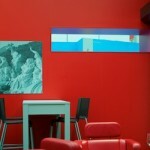 2 Responses to What caught my attention at Photokina 20112 ? I am planning to upgrade my camera to D600 soon =) Wish me luck! I’m sticking with Canon and will be upgrading to the 6D when it is available. The D600 seemed a pretty good camera. I had the opportunity to play with it at a press event here in Belgium and I was really impressed.